Engraving Ideas: Personalized Rings and Things - Page 2 of 14 - Promise Rings, Purity Rings, Engraved Gifts, Ring Inscriptions etc. Create a Runic inscription online! Many engraving services can easily inscribe anything on a ring or some other surface, as long as you provide them with a simple graphic. This method is typically used to create engravings in non-Latin alphabets. The Runic alphabet is a very stylish way to create unique engraved jewelry. Because runes were at one point actually used to write in English, there is actually some historic value to resorting to Runic characters. You can simply spell out your name or even a simple motto. A great little online app! It actually lets you select between several different styles of Runes. Full description of each style is provided for your reading pleasure. Wedding rings engraving: another idea for couples! I have previously discussed the many ways of inscribing wedding rings. Typically this involves using names, mottos, Bible verses and short poems. Here is yet another idea that just may be perfect for some couples. The idea of “our song” is a well-known phenomenon. Many couples have a song that they associate with some memorable moment in their lives. Very often this song is played during the wedding as the newly married couple dances to it (this is a memorable moment in its own right, of course). 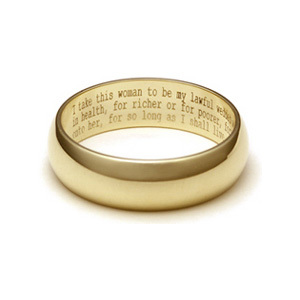 Now, wouldn’t it be clever to have the lines from this song engraved on the wedding rings? You can either go with one line or the entire text of the lyrics. If musical notation means something to you, the notes can be also very beautifully displayed on the ring. I assume that this idea would also work for certain types of promise rings. On a whim, I came up with this list of ideas for party favors. A good number of them can (and should!) be personalized. Sometimes personalization of a party favor is the craft project that the whole party is build upon. I did not make any differentiation between kids and grown-up parties, including such specialties as wedding favors, but there are ideas that can be useful for more than one occasion. The list is not comprehensive, but some of these ideas can easily be a source of inspiration for a party. Use it for what it’s worth. An engraved ring with Old Norse runes? You got it! If you are looking for a completely new approach to ring engravings, how about runic quotes in Old Norse. All you need to find is a service that makes ring engravings from image files (jpg etc). I know for fact that there are many websites that do exactly that. Then you can surprise you beautiful Norwegian girldfriend with a ring inscription that she may not be able to read, but which will definitely warm up her cold Nordic heart.